Please let me know the name or word choices from left to right. Each name is limited to 7 characters. Heart shapes count as characters. Can't decide between names? Get two names on this sterling silver necklace. 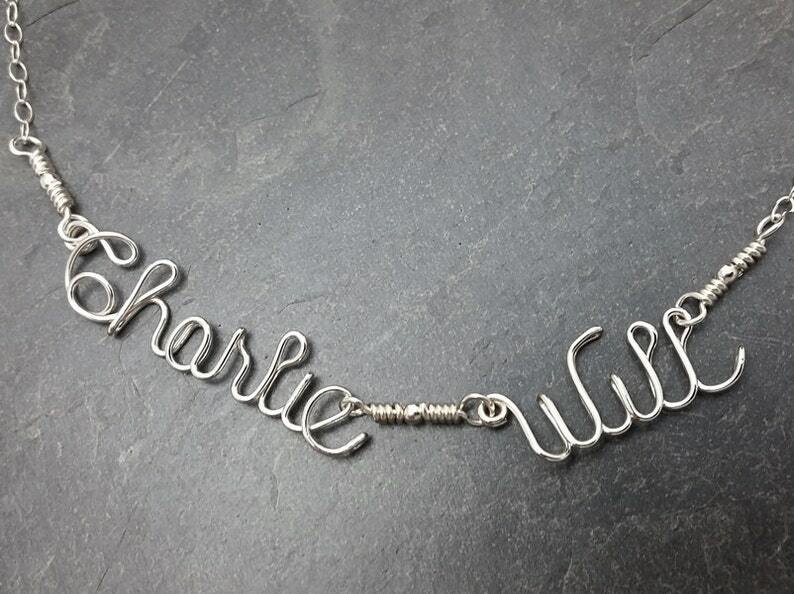 The names or words can be up to 7 characters each and are joined together in the center with sterling silver wire connections. The names are roughly 1/4 inch tall depending on the letters chosen. This comes in your choice of sterling silver, or 14k gold filled. Please make your selection form the drop down menu. This piece can measure 16 to 22 inches in total length including the names. You can let me know the chosen names or words in the note to seller field during checkout. Please no profanity or blasphemy. This comes gift boxed.